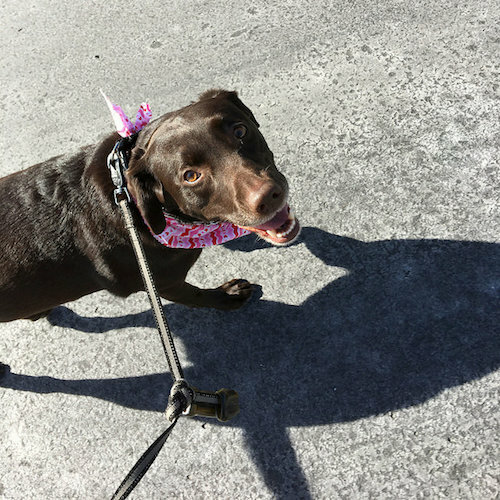 I enjoyed time with my favorite kind of chocolate on V-Day, chocolate lab! I’ve always loved Valentine’s Day. I think because it was always a special day for me as a child. I can remember decorating my Valentine’s Box for school each year, picking out specific Valentines for everyone in my class (they pretty much always had dogs on them! ), and my mom always giving me a small gift like a stuffed animal or chocolates to celebrate. This Valentine’s Day was lovely, and I feel blessed that I was able to spend time with Jimmy in the evening! He surprised me with the sweetest gift–he called me after work to inform me that he was making dinner for us. This was a big deal because Jimmy had never cooked for us before! He went to the grocery store to buy the ingredients and told me that he didn’t trust himself to cook everything. I offered to be his sous chef, and we had such a nice time in the kitchen together. Impressive, right?! The menu was very gourmet and everything tasted absolutely delicious. The best part was that Jimmy had planned everything out and thought of such a special dinner. 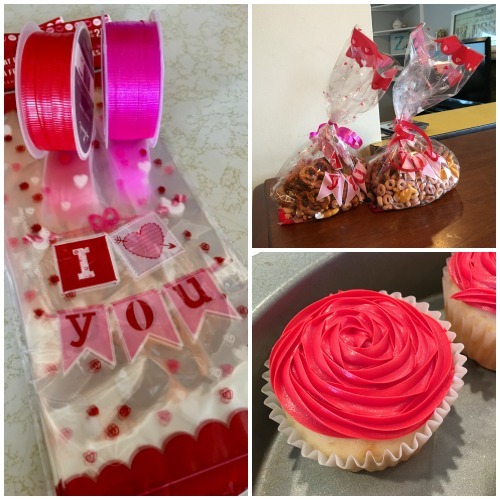 On the work side of things, the family I work for had me bake cupcakes and assemble treat bags for their kids’ Valentine’s Day parties at school. It’s really fun for me to feel like a part of a family with little ones. I think kids just make holidays extra special. I have to share some pictures from my parents, too! 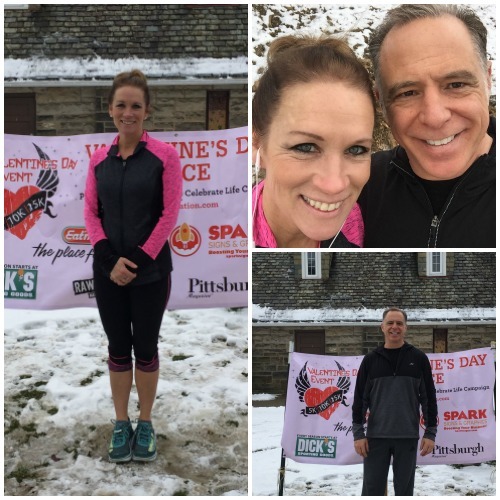 They ran a Valentine’s Day 5k together, which I thought was adorable. They finished in 32:00 minutes, which I think is quite impressive. Go mom and dad! Tell me about your Valentine’s Day! Great Valentine’s Day all around!! Go Jimmy. That meal sounds and looks so delicious. What a guy! I think cooking as a couple is really fun. I hope you guys do more of it if you enjoyed it. Congrats to Hannah and her fiancé! I bet they are so excited to build a home together. And I agree – 32 minutes is really impressive. Your parents did awesome! He did such a good job of planning out a special meal for us! I am so proud of him! I definitely hope to do more cooking together. It really was fun to be a little team! I love it that he asked you to help him cook 🙂 That’s so sweet! He’s too cute! We had a nice time together in the kitchen! It looks like you had an awesome Valentine’s Day. Love that it was a simple celebration and that’s the best kind. It’s neat your parents did a run to celebrate, too. I have friends who did yoga together, ordered Chinese takeout, etc. It is a holiday that everyone can celebrate differently and it doesn’t have to be super romantic- as long as you are celebrating love. The lady I talked to in Costco was spending it with her cat, and the cat is 16 years old and diabetic, but she gives the cat medicine each day and takes care of it. To me, *that* is love. I love that Valentine’s Day can be celebrated however anyone chooses. It’s such a fun day! The lady you talked to in Costco is amazing. That really is love!! Thanks, mom! I am so proud of Jimmy and you and dad! You guys did great at your race! Aw that is too adorable. Sounds like a perfect at time Valentines day date. it’s it great when the guy actually helps us girls out in the kitchen! Andrew always takes the role as sous chef but I can’t even complain since he’s always there helping out. 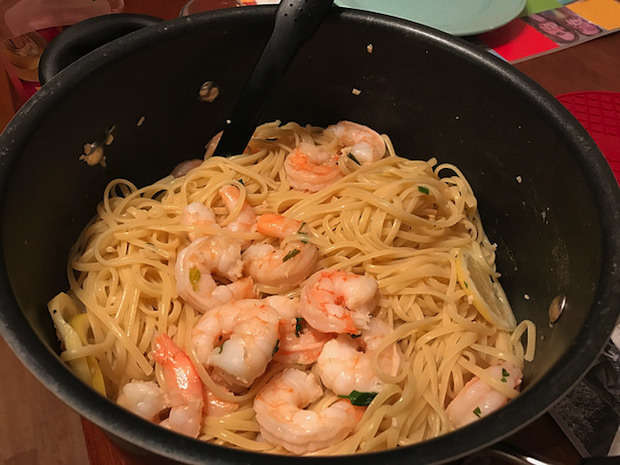 The shrimp scampi looks amazing! One of my favorite dishes, yet I surprisingly haven’t attempted to make it yet… Did you guys follow a recipe or did you have one off hand? We followed this recipe: http://www.foodnetwork.com/recipes/ina-garten/linguine-with-shrimp-scampi-recipe3 It was great! Awwww, that sounds like such a great Valentine’s Day! And I love that Jimmy wanted to help cook dinner for you!! I’m making a shrimp dinner for Nate tomorrow night, actually. I’m cooking with raw shrimp, which I’ve never done before, so wish me luck. 😉 Ha, ha. It was such a sweet evening together! Jimmy totally surprised me by offering to cook! I hope your shrimp dinner goes well! I believe in you! Wow that menu looks awesome!!! Go Jimmy! 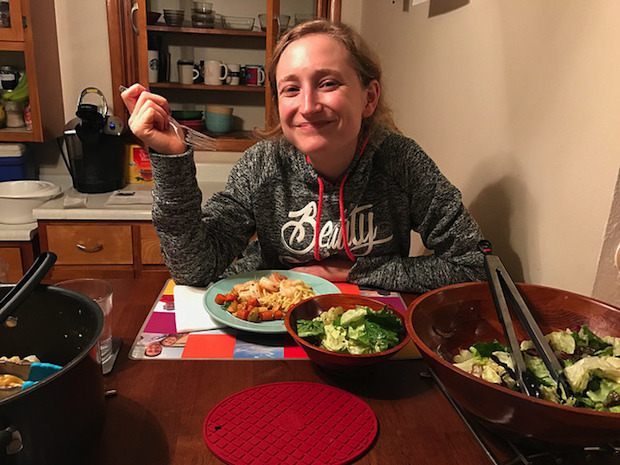 😉 I love it when Will cooks for me– it’s such a treat, especially when it’s a great meal. It was amazing! It felt like something that would be served at a 5 star restaurant!! How sweet that Will cooks for you!! You’ve got an amazing guy, Brittany! So cute! Also, dinner looks delicious. Aww, so sweet! Well done, Jimmy! And congrats to your parents on their 5k and Hannah & her fiance on their house! So many happy things in this post! He totally rocked V-Day this year! !